I thought I would share a very interesting article from one of our providers Old Mutual and David Denton, Head of International Technical Sales. It is vitally important to explain risk to clients who are transferring their defined benefit (DB) pensions. When clients’ benefits are within the DB world, all the risk is managed by the DB scheme itself and the sponsoring employer. When a transfer into a defined contribution (DC) pension is completed, the investment risks and their management become the direct responsibility of the adviser and the client. Financial advisers need to make sure that their clients understand what that means and what outcomes they could face. A good place to start is with the four concepts – longevity, sequence of returns, volatility and inflation. Once the client understands these concepts, the adviser can move on to an analysis of their personal circumstances. Here is a simple example to explain each concept. • achieves 4% per annum growth after all charges. Taking the example and plotting the outcome, over time, the £100,000 will be eroded by the withdrawals and the fund will run out shortly after the 40th anniversary. If the client lives until this point, they’ll face financial hardship because they can no longer rely on this fund. This is known as longevity risk. The average over this five year period is 4% per year. We can generate five sequences of return (1) 4%, 6%, 8%, 10%, -8% (2) 6%, 8%, 10%, -8%, 4% (3)…… and so on. Just choose a starting point for the sequence and then follow the numbers clockwise. To create a sequence that’s longer than 5 years, just keep going clockwise around the circle (repeating the five year cycle). Then use these sequences within the example and plot the outcome. This shows that the sequences have different outcomes. Two of the sequences result in more money remaining after 40 years than the average 4% pa return scenario used for longevity risk. Three sequences result in money running out sooner. The worst case scenario is the fund runs out after 33 years. 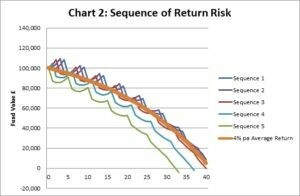 This demonstrates the sequence of returns risk. However, what happens if the investment returns go up and down by greater amounts? We can demonstrate the concept of volatility risk, simply by taking the simple sequence of returns and making them more volatile. The average over the 5 year period remains at 4% per year. As before, you can use these sequences within the example and plot the outcome. This shows that volatility has a detrimental effect. 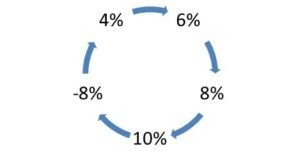 All the sequences result in money running out sooner than the 4% pa average return. The worst case scenario is the fund runs out after 23 years. 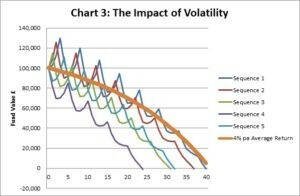 This demonstrates volatility risk. To demonstrate inflation risk we just need to take the example in 3 above and increase the rate of withdrawal by inflation. We do this to maintain the purchasing power of the withdrawals. 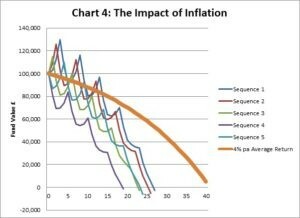 We use an inflation rate of 2% per year and plot the outcome. This outcome shows all four risks and their combined effect is very different to where we started. The worst case scenario in this example is the fund running out after 19 years and the best case scenario is 27 years. Demonstrating these concepts and educating DB clients on the risks they face is central to the PFS Adviser Good Practice guide for transfers, particularly around the attitude to risk and sustainability of income. Once clients understand, they can make more informed decisions and have a greater understanding of their adviser’s recommendations. 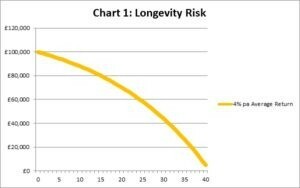 After all, they will be looking to them to help them manage these risks throughout increasingly long retirement years. This article was inspired by the Sequencing of Returns paper written by Milvesky in 2006.